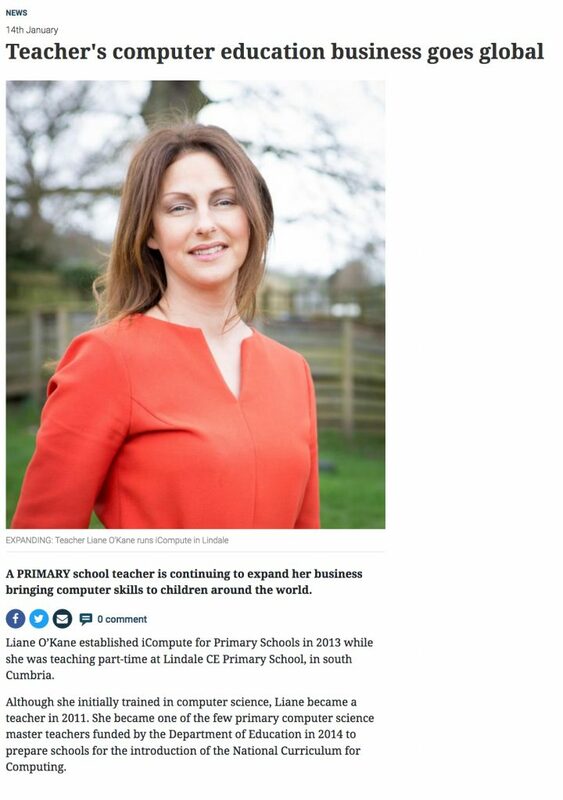 Liane O’Kane established iCompute for Primary Schools in 2013 while she was teaching part-time in Cumbria. Although she initially trained in computer science, Liane became a teacher in 2011. She became one of the few primary computer science master teachers funded by the Department of Education in 2014 to prepare schools for the introduction of the National Curriculum for Computing. Liane also saw the opportunity to develop a business to help teachers fulfil the curriculum. She used her lesson plans as a base to create schemes of work which schools could buy in and use to teach students from nursery through to Year Six. iCompute now produces schemes of work which are used by thousands of schools in the UK, as well as overseas. Most recently the Ministry of Education on the Cayman Islands, in the Caribbean, has taken on the resources produced by iCompute. Liane expects to travel to the islands to assist with the rollout in its schools later this year. “I have had the benefit of studying computing at GCSE and then degree level and then working in industry,” said Liane. She said the schemes of work included practical, active ways of teaching youngsters the concepts behind computing – for example, pretending to be the ‘spiders’ and ‘crawlers’ in a search engine – rather than hours sat in front of a screen. The resources are entirely digital, which means Liane can make constant updates to keep step with changing technology. “It is constantly evolving and I think that’s unique,” said Liane.